When people ask me: “What’s going on at DHV?” my standard reply has become: “Where do you want me to start?” It’s partly a joke, and partly a way to gauge what they’re actually interested in (or if they’re just being polite) and partly the honest truth: I just don’t know where to start. It’s been a remarkable year at Dallas Heritage Village–and we’re so glad you were a part of it. Here are just a few of the magical moments that our volunteer photographers captured in 2017. What memories will we make together in 2018? 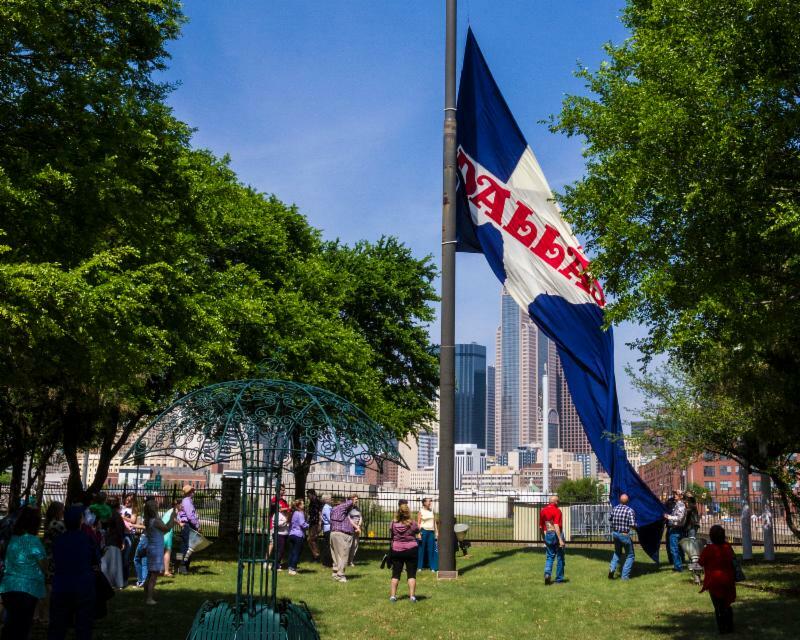 Ninety donors made it possible to create this giant replica of the first official Dallas flag. We raised it for the first time at Sunday Social, and it flew over Dallas Heritage Village through the summer. Watch for its return in 2018. Photo by Lois Lehman. 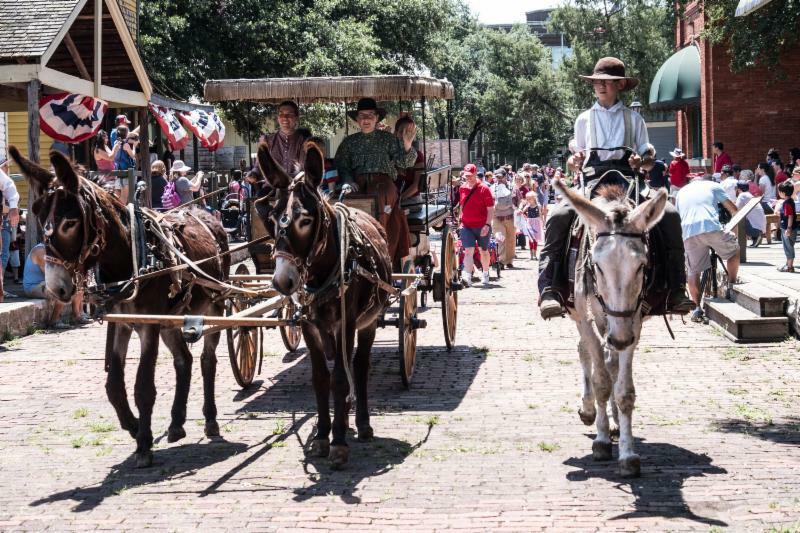 Waylon and Willie made their carriage-pulling debut at Old-Fashioned Fourth. Of course, Nip had to help show them the way. Photo by John Lehman. The Robert Kam Playhouse arrived in its new home this summer. Robert Kam was a longtime volunteer at DHV and lovingly restored this playhouse at his home in East Dallas. Thanks to his family and friends that provided the funds to move and restore it–and preserve his legacy. “Before” photo by John Lehman. “After” photo by Lois Lehman. Our fall exhibit, Neighborhoods We Called Home, wouldn’t have been possible without these fabulous partners. 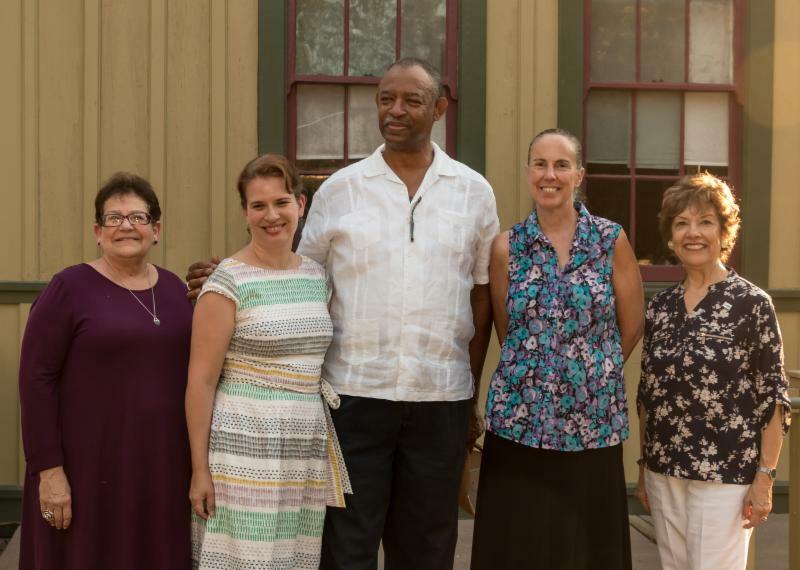 From left to right: Debra Polsky, Dallas Jewish Historical Society; Melissa Prycer, Dallas Heritage Village; George Keaton, Remembering Black Dallas; Evelyn Montgomery, Dallas Heritage Village; and Juanita Nanez, Dallas Mexican American Historical League. Photo by Bud Mallar. 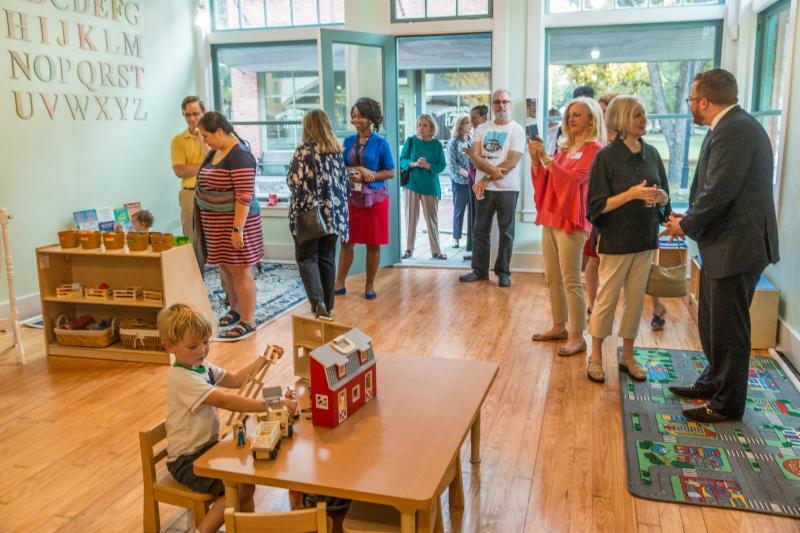 In September, the former Law Office reopened as The Parlor, a preschool play space. We’ve been thrilled to welcome our littlest visitors in this special space. Special thanks to our program partners at Vogel Alcove and our funding partners: The Institute of Museum and Library Services, The Hoglund Foundation, and The Thompson & Knight Foundation. Photo by Drew Timmons. When I put this together, I reflected a bit on the past year. There is a reason why I’m tired–and why my staff is tired! We’ve gotten a lot accomplished this year, including several projects that were literally years in the making. Almost everything in that email (except the Dallas flag) took over a year from inception to completion. I first had the idea about the Parlor back in 2010! And, of course, there’s all the things that have been going on behind the scenes that aren’t reflected in any charming photos quite yet. A reorganization of our staffing structure–no more hierarchical tree, but instead more of a Venn diagram. We’re still working out the kinks. Completion of the Visitor Counts survey–and beginning to absorb the findings. This study will go hand in hand with the work on the interpretative plan. In 2018, I’ll begin my fourth year as Executive Director–and I still feel like I’m just getting started. There is so much to do and try! I’ve also come to realize how much of this work is a long game. Every time I get impatient, I try to remember that. But patience is a challenge, especially when you’re waiting on developers to start construction. Or funders to give you an answer. I know I need to write more and share more about what we’re attempting, but finding the energy is a real challenge. And it’s also a challenge to figure out when to share–there are a few things we’ve been working on over the past several months that I just can’t share yet! So, I’m here and I’m thinking and trying to decide when to think out loud. Thanks for listening. About 30 minutes into the tour, my parents started giving me the side eye. That look that says “Why on earth did you think this would be a good idea?” and “How much longer must we suffer?” I avoided their gaze. I wasn’t too thrilled either. We were at the Whitney Plantation, just outside of New Orleans. It was the last day of our trip, and the Whitney had been on my list of “must-dos” I had read the articles about how the Whitney was putting the story of the enslaved front and center. I had read the articles about how the Whitney was becoming a leader in the history museum field as we struggle to share and interpret the history of slavery. As a director and a historian, I felt like I really needed to check this all out. In a way, it was fitting that I visited the Whitney this year. In February, I had the distinct privilege of visiting the brand new National Museum of African American History and Culture in DC. In some ways, it wasn’t a great museum experience. After all, it was wall to wall people! I got hit twice in the ankles by a wheelchair. It was hard to see everything just because of the crowds. But I couldn’t be upset. After all, it was clear that the people I was surrounded by were reading, learning, connecting—and probably hadn’t spent a lot of time in museums. The narrative put the African American experience at the center. It wasn’t just about slavery and oppression, but identity and stretching boundaries. There was a huge range of artifacts, and the curators didn’t shy away from anything. A slave cabin in the center of a gallery. One of my DHV coworkers helped dissemble it before it was moved to DC. For me, the most moving moment was as I was waiting in line to see Emmett Till’s casket. There’s a small room in front of the room containing the casket, where news footage of the funeral is played. Standing in that anteroom were two women, who I presumed to be mother and daughter. They were leaning on each other, watching the video, softly crying. It was a moment that wouldn’t have been possible without the museum. In May, I flew into Memphis for a work trip and headed straight to the National Civil Rights Museum. I had first visited back in 1997 as part of a college orientation trip. That was long before the new building and the inclusion of the boarding house where the shots that killed Martin Luther King Jr were fired. I don’t have many firm memories of that visit, but I remember liking it. I know they just went through a massive reinterpretation, but I’m not sure exactly what all was new. Again, they did a fabulous job of putting the African American experience front and center. They also had some powerful artifacts, including a bombed out bus that moved me to tears. Powerful artifacts, mixed with lots and lots of individual voices from those that were active in the Movement. So, heading to the Whitney felt like a natural next stop on this year’s tour of African American history museums. And there were aspects of it that were very good. But I have difficulty recommending it. Perhaps I should start with what I liked? The tour did start out well. The first stop was an African American church, built after Emancipation, and moved to the Whitney Plantation a few years ago. Inside, were a collection of statues of children, representing the hundreds of children born into slavery at the Whitney. There was a nice introductory video and a discussion of the WPA slave narratives. The docent discussed how those narratives captured the voices of slaves, but is almost exclusively memories of a childhood in slavery. We proceeded next to a memorial, listing all of the known names of the people brought to the Whitney during the slave trade years. And this is where the tour began to fall apart. We spent over 20 minutes at one side of the monument. And then he said “now let’s go to the other side of the monument.” Another 20 minutes talking about all of the known names of people born into slavery on the plantation. Then 20 minutes at the next memorial. Ten at the next. And then we finally got to see another building. The entire tour was 2 hours—and about half of it was spent at the memorials. These memorials are important, but do we really need to spend that much time at them? Especially in the New Orleans heat? On the day we were there, we had intermittent rain. They provided umbrellas, but the docent also made no moves to hurry the tour along or make any adjustments due to the weather. In the heat, this would be almost unbearable. Definitely not something to inspire a good visitor experience that would allow minds to be opened for learning. And then there was the tour guide himself. He was passionate. He certainly knew his history. But he was also incredibly repetitive. He did a good job of pointing out that slavery is as much an economic system as a racist system, but he said it over and over and over again. An hour into a tour, I think everyone more than understood. But the thing that bothered me the most is that even as they gave names to the enslaved, they didn’t give them much else. There were no stories of life on the plantation. No stories of how those that were enslaved struggled to live their lives within such harsh boundaries—how they made families and traditions in spite of their enslavement. There was no mention of any personal agency. All of the complexities surrounding slavery were obscured by an overwhelming agenda. As we all know, tour guides can make or break a museum visit. I don’t know if a different tour guide would have been less repetitive. However, he was certainly working within parameters set by the institution. The memorials are important, but a quick explanation of them and then allowing people to return after the tour would be far more effective. No guided tour, especially outside, and especially with few spots to sit, should be much more than an hour. Attention spans waver. Feet get tired. With my mom’s knee issues, she can’t stand for too long in one place—and there was a lot of standing in one place. It was an incredibly disappointing and frustrating experience. For those that do want to explore the complex relationships on a plantation between enslaved and slaveowner, I would highly recommend the Laura Plantation. It was our first tourist stop when we arrived in New Orleans, chosen because it had been managed by four generations of women. They did an amazing job of describing slave life and pointing out all the complexities. They gave us time to pause and reflect, but also kept us moving. Our tour guide had passion, but never let that passion overtake the pace of the tour. All three of us (parents and myself) loved the tour, felt like we learned something, and were challenged by some of that information. One of the several extant slave cabins at the Laura Plantation. As was true at many plantations in southern Louisiana, these cabins were lived in through the 1970s by workers. Most of whom were descendants of those that were enslaved on the same land. African American history is a complex subject that has long been ignored by major museums. There is some stellar interpretation out there, but we have to continue to question it just like we do any other interpretation. In this age where nuance and complexity are getting bulldozed by loud voices shouting, I commend those organizations that are holding fast to telling the complete, messy history of our past. Sometimes, we forget that museum education is a long game. Next month, I’ll celebrate my 13th anniversary at DHV–and I’m still working on something that I first thought about on Day 2. When I started in March 2004, I was able to shadow my predecessor for a few days. I remember asking her “Have you ever tried a preschool storytime?” Her response: “Oh no! My mom is a preschool teacher, and I really don’t like working with kids that age.” About a year later, I launched Barnyard Buddies, a program still going strong. It wasn’t an unusual concept–a book, a spot at DHV that connects to the book, an activity, maybe a song, and a craft.We had a blast, and the program grew, and it caused me to think a little bit differently about how to use DHV to teach. But I also remember the reaction of some of my colleagues at other museums. I vividly remember a late night at the state museum conference, where we were having some tasty beverages in someone’s hotel room. Somehow, Barnyard Buddies came up and one man said “Why on earth would you let anyone younger than 4th grade into your museum? Young kids can’t understand HISTORY.” I was dumbfounded. Yes, these kids didn’t understand the origins of the Civil War, but they sure understand that life was very different a long time ago. And that’s enough to start. Over the years, I started collecting examples of great programs and great spaces for young children. And I started collecting examples for my Hall of Shame as well. Too often, I was seeing the “children’s area” tucked into a corner, separate from the other exhibits. Too often, I was seeing very little thought put into these spaces. If we’re to stop the decline of museum attendance, shouldn’t we be doing everything in our power to attract young children and their families? In 2010, we developed a new strategic plan for DHV that included setting aside one building for a preschool play space. The building, formerly a Law Office exhibit, needed some serious repair work. A leaking roof had to be fixed first, before we ever explored other repairs and our ideas for the space. We also began to integrate more hands-on areas in other buildings, most dramatically in our General Store. In Summer 2013, we learned that Vogel Alcove (a non-profit providing childcare for homeless children up to age 5) was moving into the recently vacated City Park Elementary School–located directly across the street. I reached out to Karen, their ED, and we began to work together. They moved to their renovated building in March 2014, and by that summer, their kids had started visiting us regularly. And we realized that the Law Office project needed to head to the top of our priority list because we had kids itching to have a space just for them. Vogel Alcove uses our museum in so many different ways! In 2015, we managed to get the roof fixed. We started talking to the donors who funded the initial Law Office exhibit project. And we submitted a Community Anchors grant to the Institute of Museum and Library Services. We wanted assistance to complete the playspace, but most importantly, we wanted the money to do a long-term evaluation of early childhood learning at DHV. Because my list of shining examples of early childhood spaces and programs at museums hadn’t grown much. And there definitely weren’t too many history museums on that list. In September 2016, we got word that we had gotten the grant. I was in the middle of a luncheon at the AASLH conference, and all I wanted to do was dance and shout with joy. I restrained myself. Barely. I definitely can’t tell you what the speaker said that afternoon. And now the real fun has begun. Last week, my educator, Mandy, and I did a two-hour “baseline” interview with our evaluators. We were forced to really think deeply about our educational philosophy, how we approach early childhood learning, and what our goals are for the 3 year grant period. In a way, I was also reflecting on my career at DHV. When the succession plan was first announced, I had colleagues tell me that I needed to think twice about becoming director at DHV: “You don’t want to wake up one day and realize you’ve spent your entire career there.” I nodded and smiled, but inside I thought to myself “If I spend another 5 years at DHV as director, I’ll only be 40.” But today I started thinking about the value of that continuity–though my job has changed dramatically over the years, we’ve been able to strengthen and grow our programs in a profound way. We now have kids that were first Barnyard Buddies and are now Junior Historians. Through this program, we’ve gotten to know families. We know that our museum is an important part of their lives. How much harder is that to do at other museums where the average tenure of an educator is 2 years? The kids that joined me at Barnyard Buddies in 2005 are now in junior high or high school. With this grant, sometimes I feel like our work is just getting started. And sometimes I feel that it’s the logical climax to the work that I began all those years ago. I truly believe that this grant will be transformative, and one result of this IMLS grant will be a new chapter in DHV’s history. We’re finally putting into words and collecting the data on all of our ideas about ways to teach history, and we plan to share it with the wider museum community. There are so many things that energize me at work right now–whether it’s neighborhood development, fundraising, or this project. Every now and then, I get the question: so, where will you head to next? And when are you going to start thinking about that? And the simple answer is: I have no idea. I’m having too much fun right now. It’s a long game, but it’s a game that’s worth playing. Any time you welcome thousands of people to your museum over the course of 2 days, there will be stories. Candlelight is our biggest event of the year–and our longest running. This year, we celebrated its 45th anniversary–and it was my 13th as a staff member. At the end of each night, staff gather and share some of the stories, usually with some sort of alcoholic beverage. We call it Afterglow. I will admit that we spend a lot of time complaining and venting. Crazy things happen at Candlelight, often involving parking. One of my favorite stories of all time was when someone tried to get in the VIP lot and was denied. Man in fancy car shouted “My father is the curator! He’ll hear about this!” Max responded “Actually, my mother is the curator and she’ll be just fine.” This year, we had a volunteer refuse to serve because he had to park in a field. We also once had a truck get stuck in cistern that magically opened up. Somewhere, there’s a wonderful picture of several men staring at the hole, trying to engineer their way out of that situation. But as I was driving home on Sunday night, I wasn’t thinking about all the annoyances and stresses of Candlelight–but how this event bring so many people together. It’s a touchstone in so many lives. Wrene, one of our mighty Guild volunteers (the Guild does a bake sale that raises thousands. Also, there are delicious cookies!). She and her husband moved to Corpus Christi a few years ago, but she comes back every year for a week to help bake and then volunteer both days at Candlelight. And her husband plays piano in the Saloon. Now, that’s dedication. Banner, almost 5, who checked with his mom last week to make sure they would still see the Green Santa. Drew, who has been “Green Santa” for many, many years. I actually had a bit of time to watch him interact with some little ones, and he’s just absolutely amazing with them. Margaret, who came to Candlelight on a first date. And then she brought that same boy back as her husband. And then this year, she brought their month old daughter. Margaret is also a fellow Hendrix alum, which makes it all even neater. Gary, my predecessor, who was finally able to enjoy Candlelight as a visitor–and brought almost his entire family with him! Ron, who started setting up his childhood trains in the Depot several years ago–and was featured on tv last week. It’s a lovely story. We moved this carriage for a special photo op–and had to get a few funny photos! Cedars neighbors, who showed up in force. I’m sure it’s just a coincidence that I ran into so many of them in the Member’s Lounge, which also happened to be the only place at DHV where you could get an alcoholic beverage. . . I could go on and on. This is an event that takes many hands, but is so important to so many. Shortly after I took over, we worked on a new vision statement and eventually landed on “a place to make history.” We wanted this vision to be both about being active participants in the past, but also acknowledge how this museum fits into many people’s lives. Though Candlelight may not be one of those events where people learn a lot of history, a lot of history is certainly made each year. And that’s an awfully important role that a museum can play. Last month, I headed to Detroit for the American Association for State and Local History‘s annual meeting. It’s always an inspiring few days, but sometimes that inspiration comes from rather surprising places. As a general rule, I don’t love art museums. As someone who doesn’t know much about art, I want to learn about art when I visit an art museum. But so many art museums stick with a very basic label formula–artist, title, medium, date. I’m always left wanting to know more. Maybe I should just stand there and let the art wash over me, but that’s just not how my brain works. But I knew I wanted to visit the Detroit Institute of Art. They’ve been through hell and back, and if nothing else, I wanted to support them. Plus, I do enjoy Diego Rivera. Jenn and I were completely blown away. It is a massive institution. The collection is incredible. But even more amazing–I learned about art! Loved how casual this was. Everywhere we turned, there was an interesting tidbit on a label. An invitation to look more closely, ask questions, all those things that I want to do in a museum. There were simple, low tech interactives. Decorative arts were mixed with fine art. I don’t think I’ve ever enjoyed myself so much in an art museum. One of my favorite exhibit rooms–the entire gallery was about portraits, and this label invites you to compare the two dominant styles of the period and decide which you would prefer for your own portrait. And then we wandered into the Great Hall. And the Diego Rivera murals. It was breathtaking. Sometimes I wonder what it would be like to work in a truly “fancy” museum–I think I would be less likely to get away with jeans. No way to really capture the scale. I think what I loved the most was the contrast between the murals and the architecture of the building. It also is worth mentioning that every staff member we encountered was absolutely delightful. Security guards asked us great questions and shared their favorite piece in a gallery. Volunteers seamlessly directed us through galleries, pointing out certain pieces and sharing great stories. We had so many great conversations about art during our visit–which is exactly what is supposed to happen at a museum! From the labels to these interactions, it’s clear that the DIA is working to make their enormous institution more personal and more accessible for all. One of my former staff members now works at the DIA, and we met for lunch. I started raving to her about how wonderful our experience had been and she explained that every single label in that museum is written by a team–a curator and an member of the interpretation staff. Just by the nature of the positions, there’s also usually some sort of generational divide as well. So, all those labels had been discussed and fought over by multiple people. That push and pull between curatorial and education garners some pretty powerful results. At a small institution, it’s a lot easier to work on teams. If you need another set of eyes, you have to go outside of your department–because you’re a department of one! That’s such a harder thing to do at a large institution. If nothing else, it inspired me to make sure we continued to work on exhibits as a team at DHV. If the DIA can do it, we can do it too! I’ve been following the good work done by Stawbery Banke for years. In a lot of ways, we have more in common with them than any other museum–located in an urban environment, no huge endowment to shore up finances, lots of buildings to interpret and care for. It was wonderful to tour with Larry Yerdon, their director. He spent most of the day with us, on crutches, no less! My favorite exhibit element is the house they left completely unrestored–layers of wallpaper, exposed lathe, holes, etc. Tuck traveled with me, of course. It was remarkable to see some of the entrepreneurial elements they’ve put into the museum–an independent museum store (providing a second entrance to the museum! ), residential and business rentals on second floors, etc. Everyone we encountered was absolutely lovely, and I don’t think that was just because we were walking around with their boss. Highly recommended if you’re in the area. There’s also a great brewery, Portsmouth Brewery, not too far away! I was staying in Quincy, so it seemed logical to visit the homes of the Adams family. I’m no colonial historian, but when in Boston, it’s required to dip your toes into the Revolution. Peace Field, the Adams’ last home, was delightful–it’s rare to see a house that shows generations of ownership. And then there was the library! The tour guides did an excellent job of telling the story of the family, not just the Presidents. And I admit it–I had a bit of a “historical moment” (upswelling of emotion, often resulting in a tear, at the weight of history in a physical place) standing outside the room where John Adams died on July 4, 1826, thinking of his friend and enemy, Thomas Jefferson. The Library at Peace field is swoon-worthy. I will admit I wasn’t as impressed by the JFK Library. After a stint as an intern at the Sixth Floor Museum at Dealey Plaza back in the dark ages and solid friendships with many staff members, I’ve learned a fair amount about Kennedy. The introduction film was excellent, the beginning of the exhibit pretty good, and then I started asking myself some pretty key questions. Where is Jackie? Where are the kids? And there were minor exhibit annoyances too–too many Kennedy voices around me, saying different things. An unclear exhibit flow. And then, we got to the assassination. It was just a hallway, painted black. On one side, silver letters that said “November 22, 1963” on the other side, a series of small screens, playing the footage of Walter Cronkite announcing his death and some shots of the funeral. That was it. No context. No explanation. Just an exit into a bright, cheerful gallery about his legacy. I was sputtering in shock. The building is very impressive, even if I didn’t love the exhibits. Now I get why the family doesn’t like to talk about this tragedy. Aimee said “Well, everyone knows the story.” But I really don’t think they do. The Sixth Floor Museum is constantly struggling with how to keep the story relevant, now that most people don’t have memories of that day in Dallas. It could be simply done–just a few paragraphs about why he was in Dallas and the immediate aftermath. The Library also misses a chance to create a “historical moment.” Where’s the emotion? Where’s the mourning? It can be done tastefully and well–perhaps follow the example of the Bush Library and their treatment of 9/11. But I feel that the visitor deserves to know more about that crucial turning point in American history. On Saturday, I was solo and decided to do a hop-on/hop-off trolley. At the last second, I decided to hop off at the USS Constitution spot. As a rule, I’m not a fan of military history, but I remembered that they had won some major grants and awards to research family learning. And they deserved every award! It was a busy Saturday, and people of all ages were enjoying the exhibits, playing with the interactives, and talking with staff. Love, love, love! I’ve walked goats in my career, but I’ve never hauled one on to a ship. Such a fun touch! On Sunday, we visited the Governor Lippitt House Museum, run by fellow SHA Alum, Carrie. Such a beautiful home! And such a great family story! I will admit that I am a bit envious of her only having one house to worry about. We wrapped up our adventures with a trip to RISD (Rhode Island School of Design) that had a special Todd Oldham exhibit. Some truly wonderful pieces, but the layout of the museum was one of the most confusing I’ve ever encountered. Three museum pros couldn’t figure it out! It was a museum-filled trip, and I think some don’t quite believe it was a vacation. And yet, I still came back to Dallas, relaxed and energized. Good museums and good friends will do that for you. We all have our museum bucket lists–places that we desperately want to visit. Sometimes, it’s because of an admiration for whoever’s home it was. (See Louisa May Alcott’s Orchard House). Sometimes it’s due to its place in a favorite book (See Green Gables). Sometimes it’s because you admire the work that they’re doing (See the Pittsburgh Children’s Museum). Sometimes it’s amazing, grandiose architecture (see Biltmore). Last week, I got to cross another museum off the list: the birthplace and home of Juliette Gordon Low in Savannah. Yes, as a matter of fact, I was a Girl Scout. I was part of the very first group of Daisys (for kindergarten age girls), and my mom was our leader. Like many, our troop fell apart in Junior High, but I continued to be a member, helping out with some younger troops that met at our church. I never pursued the Silver Award or Gold Award, but I kept my membership up through graduation. And through all of that, I wanted to visit Savannah and see Daisy’s house. It was pouring rain when we arrived, so the carriage house was pretty crowded. We were a group of 5 (my parents, myself and family friends D&S), and only mom and I were looking forward to the tour. D&S kept asking “Now, it’s not just a big museum about Girl Scouts, right?” And I kept saying “It’s a beautiful historic house that was the founder’s home. So yes, there will be stuff about Girl Scouts, but it’s also a fancy house tour in Savannah.” (they really wanted to see fancy houses). When the next available tour wasn’t for an hour, the companions weren’t happy at all. So I went back to the ticket desk and asked if we could move our tickets to the next day. We couldn’t but she happily gave me a refund. Historic House Win #1: The staff at the front desk was incredibly gracious, helpful and nice. Even though I was totally “that customer.” And this continued throughout all of our interactions with various staff members. After all this, mom and I told the rest of the group that we were absolutely fine if they didn’t join us the next day on the tour. But that we were going No Matter What. At the last minute, they decided to join us. The next morning, we headed back and were able to get tickets on the first available tour. We had a little time to kill, and D&S walked the neighborhood while I chatted with the director, Lisa. She and I were on an IMLS panel review last summer, and she had taken the job at Low about six months ago. I don’t know her super well, so was hesitant to say to frontline staff “Hey, I know your director. Is she available?” But I’m so glad we did! We got recommendations for afternoon activities and dinner, plus it was good to hear more about the behind-the-scenes. Lisa mentioned that she came into an organization with an incredible team that was ready for change–and this became even more evident as we met more of her staff. I knew the tour was off to a great start when the guide, Michael, asked our group “How many of you are Girl Scouts?” Most raised their hand. And then he said “This is your house.” And that was fundamentally the attitude throughout the tour. Historic House Win #2: The museum clearly approaches their visitors with an attitude of trust: there were no ropes or barriers. On the second floor, we were allowed to wander freely after hearing the basics. It was incredible. Historic House Win #3: Though the kids and their questions came first, there was a wonderful balance for everyone in the group. This is so hard to do, and I applaud them for it. D&S were dreading going on a tour with a troop of Girl Scouts, but they later said that part of what made it so special was the presence of the kids. Historic House Win #4: It felt like a real home. Part of it was that so many of Daisy’s things are still in the collection–and she had a pretty strong personality! And of course, part of it was the lack of barriers. But again, it was also the attitude of our tour guide. He asked if anyone would like to play the piano in the formal parlor. No one raised their hand, but then we asked if he would play for us (we may have been told to do this by his coworkers). And he sat down and played, and it was one of the most magical moments I’ve ever had in a house museum. Historic House Win #5: They aren’t afraid to play with tradition. About a year ago, they transformed the library into a hands-on learning space. It includes some real artifacts, but the centerpieces is this amazing table filled with lots of different activities. Of course, I’m a sucker for anything to do with books, so I fell head over heels in love with the space. It’s the last stop on the tour, so you can spend as much time as you like in that space. The girls on the tour seemed to love it too–and they were still there long after we left. This historic house museum was on my bucket list because of my childhood admiration for Juliette Gordon Low. I had no idea how much it would inspire me today, in my grownup career as museum director. It is truly one of the best house tours I’ve been on in a very long time. Three cheers for the Girl Scouts!